I don’t want to sound harsh, and I recognize that there are a host of factors behind the actions of these fans. Still, I am continually amazed at the human heart’s propensity to worship and give honor to things as petty as sports and traditions – so much so that at it’s worst, we are willing to take life (both human and arbor). I’m sure they were magnificent trees, Alabama’s loss was heart-breaking, and it sounds like it was some pretty poor soccer being played, but what these actions show me is that whenever our idols are endangered (which, in itself is an irony that a idol is in need of saving), we will do whatever we can to avenge them or protect them. GUATEMALA CITY — The vice president of a last-place soccer team in Guatemala has been shot to death after receiving threats about the club’s poor play. National Civil Police spokesman Donald Gonzalez said Saturday no suspects have been detained in the killing of Carlos Noe Gomez. Gonzalez said the club executive was killed late Friday as he left a team meeting in the northern province of Huehuetenango. Prosecutor Nery Martinez says the investigation is focused on the threats Gomez reported receiving several weeks ago. Deportivo Xinabajul is last in the country’s national league and lost 2-0 at home this week to Suchitepequez. AUBURN, Ala. — A steady stream of people gathered to mourn the apparent imminent demise of the poisoned oak trees at Toomer’s Corner, where Auburn fans traditionally celebrate wins. The crowd of old and young alike, many clad in orange and blue, began arriving early Saturday morning for the rally dubbed “Toomer’s Tree Hug” and carried on well into the afternoon. 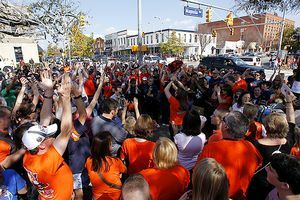 AP Photo/Butch Dill Thousands of Auburn fans joined in at a “Toomer’s Tree Hug” rally Saturday to show support for the historic trees that have been poisoned. A fan of rival Alabama — Harvey Updyke Jr., 62 — has been charged with first-degree criminal mischief for allegedly using a tree-destroying herbicide to poison the two 130-year-old oaks after Auburn beat the Crimson Tide in November. He was released from the Lee County Detention Facility on bond Friday night. It’s a bitter, state-encompassing rivalry — one where the lack of professional sports in the state and two schools dominate the sports landscape makes it different than other storied sports rivalries like North Carolina-Duke, Ohio State-Michigan, Red Sox-Yankees or Lakers-Celtics. But the heinous act even has devout Alabama fans saying this is taking it too far. One group of ‘Bama fans has started raising money for replacements for the oaks. The Toomer’s traditions — including the famously sweet lemonade at Toomer’s Drugs across the street — are ingrained in the state’s culture, like Alabama with Bear Bryant and Denny Chimes. It’s where hundreds of fans celebrated the recent football national championship on Jan. 10. Toomer’s Corner separates the Auburn campus and downtown, a quick walk from Jordan-Hare Stadium. And the vandalism has hit the Auburn community hard. Retired Auburn athletic director David Housel tried to put its significance in terms people outside Southeastern Conference country can understand. F.O. Ferguson of Sylacauga, Ala., who came to his first Auburn game in 1934, said Toomer’s Corner is a landmark that means a lot to Auburn people. Joyce Parker, an 86-year-old Auburn alum and football season ticker holder, was not about to miss the rally, driving a few hours from her home in Gadsen. ← >Why are Christians so intolerant! ?